OK. I'm sure the first thing you think of at Hilton Head is NOT Mexican restaurants. Mom and I went to several while at Disney's Hilton Head Island Resort. Santa Fe Cafe is almost right across the street from the entrance into Shelter Cove (where the HHI resort is located). We enjoyed our lunch there and the presentation was fantastic. 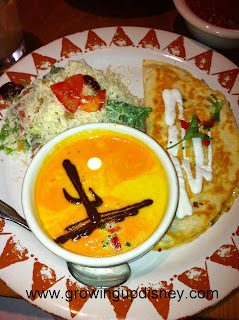 This is my plate with the Painted Desert Soup (which was fantastic). Keep reading Growing Up Disney for my post on the Mexican Restraunts we visited on Feburary 24th. I went to one of those in Wisp, MD (ski town) about 5 years ago and had that soup - it was incredible!! The best thing was the buffalo chicken dip - it was incredible and we've been trying to recreate it since! Now I'll work on getting us a trip to HHI!